Your premier connection to Colorado’s spectacular West Elk Wilderness and your Rocky Mountain Adventure of a lifetime. 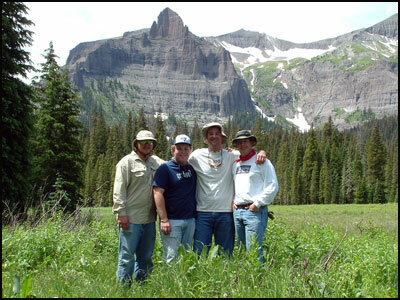 Authentic trail rides, horse packing trips, high alpine fishing trips, tent bed and breakfast trips, backpacking trips, and youth adventure camps. Horseback hunts in the legendary Gunnison high country. First-class fully guided hunts for elk, mule deer, bear, and bighorn sheep with archery, muzzleloader, and rifle. Climb into the saddle, grab your reins and ride with us into the magnificent West Elk Wilderness area for an adventure filled vacation. 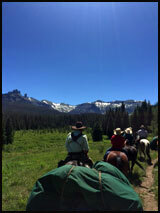 At the trail head your guide will go through a short, but thorough training on riding the high country trails, before carefully packing your personal gear on one of our experienced pack horses. Your adventure begins with a leisurely two hour ride into our base camp, your home away from home for the extent of your trip.Our first-class camp is equipped with roomy 12X15 canvas wall tents accommodating up to five guests each. Furnishings include wall-to-wall flooring, screened windows and doors, base camp style cots with mattresses, and solar lighting. You’ll enjoy delicious ranch-style meals prepared and served in our spacious 16x32 dining tent. 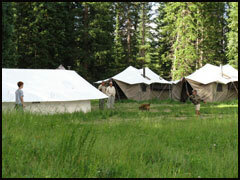 Other facilities include a latrine tent, tack tent, and guide tent. This trip is individually designed for you, by you, so you select the daily activities. Choose from hiking, fishing, photography, bird and wildlife watching, or the ever popular horseback riding. There are literally hundreds of miles of wilderness trails winding along the volcanic ridges and through the scenic valleys offering half day to full day expeditions. We know the country and how to get to those breathtaking out of the way places like Cross Park, Sheep Basin, Storm Ridge, and the Benches; secluded basins and ridges off the beaten path that very few ever have the opportunity to see. This trip is designed to expose you to some of the most spectacular country in the Rockies, so bring your camera and plenty of film. We’ll be happy to customize a two to five day dream vacation for you at an affordable price. Give us a call and let our experienced experts handle all the logistics of your trip, leaving you free to relax and enjoy a worry free high mountain vacation. If you like horseback riding and enjoy the great outdoors, or you just want to get away from the hustle and bustle, then this is the wilderness adventure for you. 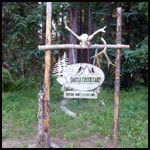 Our summer camping trips run from the middle of June through the middle of August. Don’t wait to long….contact us now to reserve your dates. for making our camping trip one of the best vacations we’ve ever had. We’re planning to make the trip again soon!